Meet Estie! 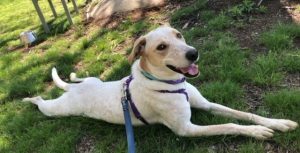 This sweet 2-year-old Lab/Hound mix is a sociable, curious, even-tempered gal, with a playful and sunny disposition. She takes well to training and is eager to please! Estie would love to find a fun-loving and active family to go exploring with on walks and hikes, as long as she’s their only dog! At the end of the day, she’ll happily relax with you and give you kisses! Estie’s story began in Louisiana as a puppy with her sister Amber. They ended up at a shelter in New England and have had a pretty rocky ride since. The pair lived in a small condo together and were not receiving nearly enough physical or mental stimulation. So understandably, they became bored and started behaving badly. Their owner couldn’t handle the rambunctious sisters, and decided to send them to Florida to live with her mother. They made it to Maryland with the friend who was transporting them, and then she brought them back to Connecticut. They lived in a foster home where a dog walker would come a few times a day. After a few months of that living situation, we were able to bring both Estie and Amber to our Sanctuary. Once they arrived, we realized that they desperately needed to learn how to experience life independent of one another. And once they did, both started to blossom into their own loveable personalities! Estie loves going for walks, running in the play yards and LOVES the digging pit we have. She will take a tennis ball, bury it and then dig it up again over and over! She’s a quick learner, and is progressing quickly through our Canine College lessons. Estie also participates in our Buddy Project working with youth at risk for school failure. This adorable Lab/Hound mix hopes to find a forever family of adults and possibly teens who will give her plenty of attention, exercise, and love. She is well-trained, well-behaved, crate trained, and about 55 lbs. She only requests that she’s the only pet in her new home. Estie wants to be YOUR bestie! To learn more about this affectionate and playful pup, please email Jess@OurCompanions.org or call 860-242-9999 x302. Hi Toni, you can find pictures of our adoptable dogs here: https://www.ourcompanions.org/dogs/dog-adoptions/ and our cats here: https://www.ourcompanions.org/cats/cat-adoptions/. Thanks!